I can never seem to catch our animals, or for that matter, my family members, on camera when they’re in the act of doing something interesting. I always get something blurred, or dull, a few moments later. But NASA does a better job. 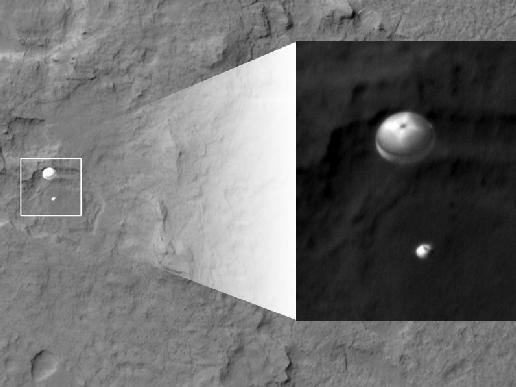 The Mars Orbiter, with split-second timing, caught this photo of Curiosity on its way down to the planet’s surface. The inset is a close-up of the landing craft hanging from the huge, supersonic parachute that helped slow Curiosity to a safe landing speed. If this doesn’t win an award for best action photography, I don’t know what will. Mars Landing in an Hour and a Half! I’m in my office, working. But Curiosity lands on Mars at about 1:30 a.m. Eastern time, and I don’t intend to miss it. It doesn’t seem that it’s going to be carried on any of the two thousand channels Comcast offers, so I have NASA TV set up via several different URLS, in different browser windows. In Chrome, I’ve got http://www.ustream.tv/nasa set up. At least one of them ought to work! Just to get in the mood, I rewatched the Seven Minutes of Terror. Watch Curiosity Land on Mars in Realie Vision! NASA’s latest wonder-probe to Mars, Curiosity, is scheduled to land on Mars at 10:31 p.m. EDT, on the night of August 5th. Be there, and don’t even think about being square. NASA has worked out a way for folks online to experience the event using some kind of 3D software on their computers, and even on their Xbox game sets. Who says NASA doesn’t have a sense of wonder? Go here to see all the different activities they’ve worked out for folks to do in connection with the Mars landing, or here to get set up with the Unity Web Player to experience the landing to full effect. They’re encouraging people to start getting set up now, so everyone isn’t crashing the servers getting set up on the night of the 5th. Go here if you want to learn more about the mission. Just how exciting could this landing be? After all, we’ve landed on Mars before. But not like this. Take a look at this video to see just how difficult this feat really is. If this doesn’t get you pumped, better check to see if you still have pulse. Pop it up to full screen if you can. If you have trouble viewing it on this page, go to the source.